Spring has sprung in North Iowa and last week when I got home from my travels and sorted through all of my collected mail I had an unexpected package. You know the kind—the totally surprise box from a person who you don’t usually get boxes from. I was intrigued as I saw the return address was of Coleen who is my second cousin on my mom’s side of the family. I really don’t have a lot of memories of playing with cousins and other relatives when I was growing up. With a dad who was a minister our travel time on the weekends was usually very limited so family get togethers were pretty hit or miss. I don’t remember Coleen from my childhood days but I did meet up with her several years ago when we attended the funeral of a relative. We found each other on Facebook (the uniter of all friends past and present) and have kept abreast of each other’s activities a bit here and there. So when I found this large package from her I was a bit surprised and amazed. When I opened it I found this. The perfect teapot, don’ t you think? Apparently she was shopping with her kids in Nashville, Indiana and found it and thought of me. I was really touched. What a sweet and totally unexpected gesture from a friend. 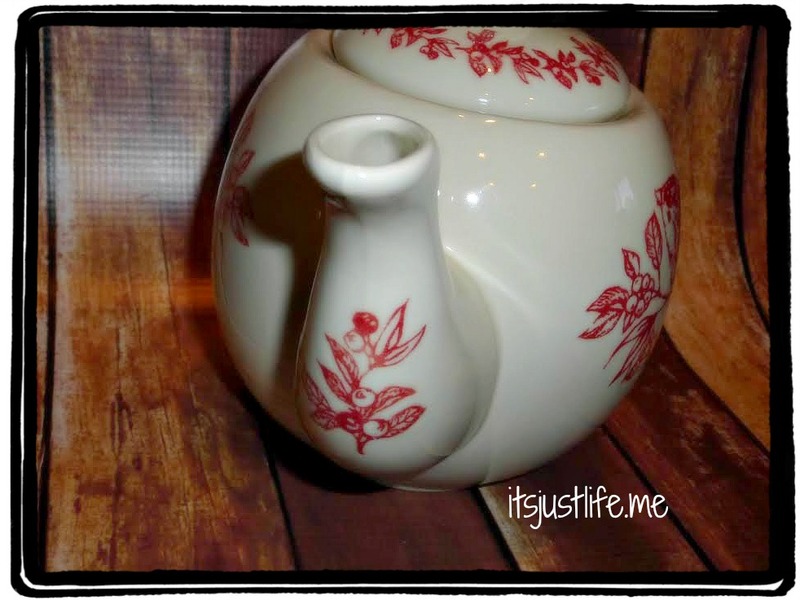 It really is a beautiful teapot and combines a lot of my favorites all in one teapot. 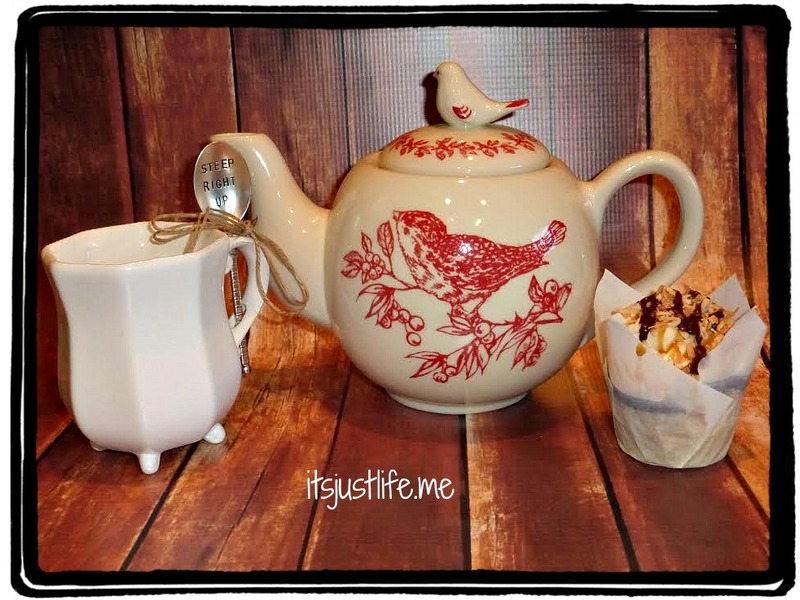 My favorite color red, birds that I love to watch and feed and a teapot all rolled into one fabulous present. Thank you, Coleen, for such a sweet and thoughtful gift. In case you noticed the cute mug and spoon –the hubby got me that and isn’t it the perfect cup to sip a nice oolong from? I think I might do that right now. Thanks for joining me on yet another Teapot Tuesday. They just keep on coming and yes—one of these days I will actually make an effort to count them. I promise. And today just for the fun of it—a few tea and teapot related jokes for your reading pleasure. Why must you be careful of tea at night? What kind of music do teapots like? What does a teapot say to her hairdresser? Why did the teapot get in trouble? What did the teapot wear to bed? I am so glad you like it! Have a happy birthday today! And Praise God for reconnecting us! I love that pot, and unexpected gifts are the best! That is why I enjoy sending them out! Thanks, Denise! This one is really special! Surprise packages in the mail are always fun, I think. This one was no exception! So sweet. I agree that this teapot is perfect for you. Just perfect. I hope you’re having a wonderful day, my friend. Happy birthday! What a nice teapot from Coleen. I am so glad that we got to see her. As Beth said,we were not able to visit our relatives like we did when I was young so my children do not know many of their relatives. I love her! 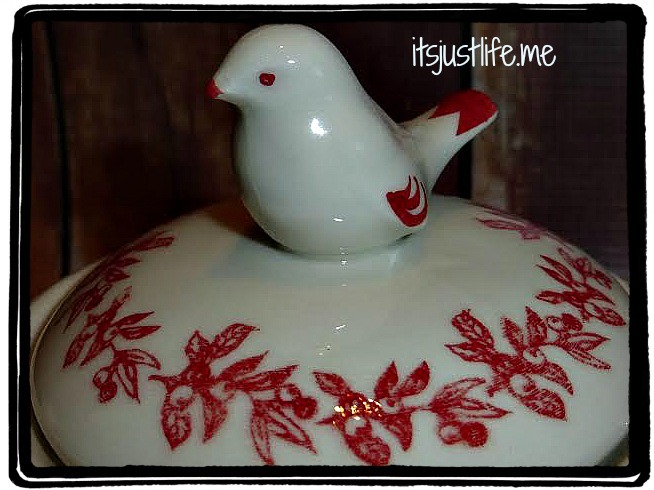 The little bird on the top is so sweet & dainty!! Happiest of days to you! Very nice and a very Happy Birthday! I love it as well. It was such a sweet surprise. 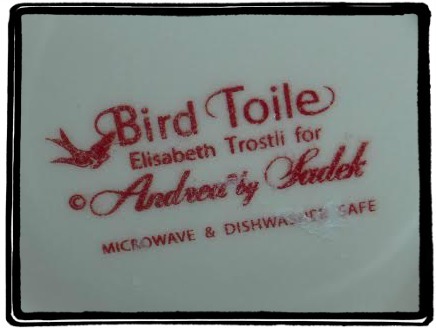 I love that little bird on top! What a nice surprise! Love the mug too! Hubby got me a mug a few years ago & I use it every day. It’s the perfect size for a great cup of coffee!